Former CIA contractor Edward Snowden requested asylum in Ecuador, according to the country’s foreign minister. Ecuador’s foreign minister said Sunday on Twitter that Edward Snowden, a former US intelligence contractor wanted by the United States for revealing a highly classified surveillance programme, had requested asylum in Ecuador. “The government of Ecuador has received an asylum request from Edward J. Snowden,” Ecuadorian Foreign Minister Ricardo Patiño Aroca wrote on his Twitter page. Snowden, 30, left Hong Kong on Sunday, a day after the United States formally requested his extradition. A passenger who was on an Aeroflot flight which Snowden took to Moscow told RIA Novosti that the former CIA contractor had gotten into a car with diplomatic plates on the tarmac at Sheremetyevo Airport. That organization’s founder, Julian Assange, has been staying at the Ecuadorian Embassy in London for more than a year. Snowden, who worked for US defense contractor Booz Allen Hamilton, hit the media spotlight in early June after he leaked to the press information about a US government surveillance programme that allegedly monitored phone and electronic conversations of millions of Americans. The US government has asked Ecuador, Cuba and Venezuela, not to allow Snowden in or to expel him if they do, according to an Obama administration official told CNN on Sunday. Washington has also requested countries through which he might pass not to accept him. The White House said on Monday that it expects the Russian government to “look at all options available” to expel Snowden back to the United States to face espionage charges, according to a Reuters report. 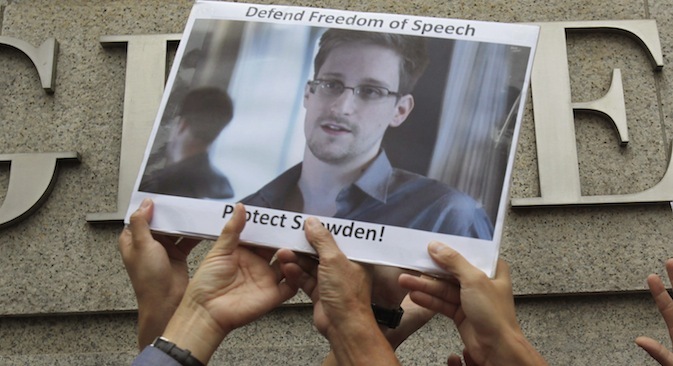 Moscow’s decision to allow Snowden to leave the country is bound to have repercussions on Russia-US ties. First published in RIA Novosti, ITAR-TASS.